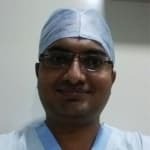 Dr. Pravin B.Jadhav is working in ASG Eye Hospital as Cataract (Phaco technique) and Glaucoma surgery specialist. Dr. Jadhav is having vast experience of doing Catarat (Phaco technique) and Glaucoma surgeries. I have hypermytropia since last 7years n the power is left eye 4.00 right eye 2.50 so plzz suggest me the medicine. I am 21 years old and having vision problem to both eyes. Is it possible to go for a laser surgery now? And what is the procedure for that? Hello. There is no medication or food for improving eye sight or to get rid of glasses. Get your vision tested and wear glasses. If not interested in glasses then you can try a. Contact lens b. Lasik as your age is now 21 years so your number will not increase now whether you wear glasses or not as number becomes stable at age of 18-20 yrs. Having said that I advise you to eat balanced diet including green vegetables and seasonal fruits for keeping eyes and body healthy. Lasik is a very easy and painless procedure. If you want to get rid of glasses then go for lasik before lasik, doctor will do some tests and if all tests are normal then you can safely undergo lasik surgery. I have red eyes for over 3 days. I have allergies from sun light and soil. What should I do to sort out this problem. My daughter in law is having short sight eye disorder of -15 and is wearing contact lens and some times spects. Whether is correctable by operation? It can be corrected by surgery in which a specially designed lens is placed permanently inside each eye. Some eye scans are required before surgery, to make sure about the eligibility. Sir I am 30 year old mujhe far ka dhundla eyes se dikhta hai. Please kuch suggest kare. Hi I am dhinesh, using mobiles and systems is my work which results some pain in my eye. Kindly advice an solution. Take frequent and short breaks for staring at the screen and look at an distant object for few minutes... Give hot and cold compression. Keep habit of blinking your eyes often. Take a Multivitamin tablet... Do Pranayama regularly... Use a good glasses to avoid harmful effects... And Consult for Homoeopathic treatment..
First of all thank you doctor. Means exophoria is not visible squint? Right? until eyes are covered? Right? And is exophoria harmful? I have exophoria of 4prims in both eyes. Hello you are right. In simple language. Exophoria is not visible squint phoria is a common phenomenon. More than 70% population is phoric (eso or exo) we do not treat phorias until unless it is creating problem in patient. I am losing my head hair and watching is also from 2 years what is this and how can I stop loosing hair fall and what are the symptoms fungal infection in my head. Please note the following in respect to your queries: there can be many reasons behind your hair fall - like mental worries, nutritional deficiency, hereditary and anaemia. Take homeopathic medicine wiesbaden 30 (5 drops in little water) twice a day for 15 days and revert. Apply jaborandi hair oil. Drink 8-10 glasses of water daily. Eat healthy and balanced food like pulses, green leafy vegetables, fresh fruits and nuts etc. Add more vitamin rich food to your diet. Avoid stress and anger by meditation. Cut down the use of hair spray, hair gel. Take sound/good sleep. Avoid too much exposure of your hair to sunlight/ hair styling tools, as they damage hair and cause split ends. After cataract operation my husband has heaviness/drowsiness in the head/eyes esp. In the evenings. He is a very nervous person and after the operation he has become worse. Does not want to go anywhere, impatient in a traffic and wants to return back. He has to do the second eye operation. Soon but looking to his condition I feel apprehensive. Hello doctor, I feel laziness frequent, water in eyes frequent, I feel that I am little bit fat, also I want to lose my weight, my work is sedentary, kindly give me tips and tricks, some diet plan for that. Thanking you doctor. Take high fiber low fat diet. Drink lot of water everyday. Take small and frequent meals at regular intervals of 2-3 hrs. Avoid outside food completely. Ask me privately for customized diet plan for you.